‘Tis always the season to turn your house into a cozy home! And the cool thing about cozy is that you can do it without breaking the bank. 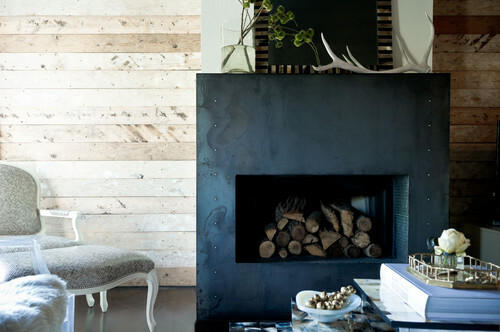 After much research on Houzz, I came up with these 15 great ideas from interior designers. You can put them into place in any season. Seeing the logs ready and waiting makes the warm and fuzzy feeling come right out. Kindling looks great in woven baskets, while wood can be stacked beside or even inside the fireplace, as Jamie Laubhan-Oliver did here. Dark walls will make a room seem smaller, whereas light paint colors on the walls can make a small room seem larger. In this bedroom by Lindsay Pennington Inc., the yellow glow of the table lamps reflects beautifully off of the glossy wall paint. Nothing says “snuggle here” more than a heap of pillows. Margot Hartford photographed the serene, delightful space shown above; the pillows make me want to sink down and read a good book. The high sides of the wing chairs, such as the red-and-white pair in this living room by Tiffany Farha Design, will capture heat and mute noise in the room, creating for you a cocoon-like spot where you can relax from the long day. You have to be skilled at carpentry to panel walls yourself, but it will definitely make a room feel much cozier when you’re done. In the incredible room shown here, Inspired Dwellings paneled the walls and ceiling, giving the feeling that you’re inside an elegant treehouse. 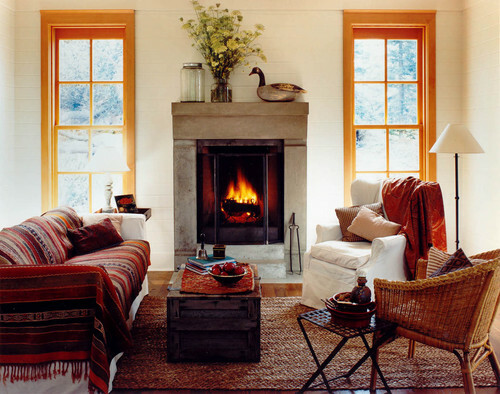 Throws in warm colors–reds, oranges, yellows–will warm up a white or cool-colored sofa instantly. If you add one made from a natural weave or vibrant pattern, as Bosworth Hoedemaker did here, the effect will be enhanced even more. A cozy home involves all your senses. When that aroma of carries through the house you’ll immediately feel good. Or, fill it with the aromas of homemade soup. 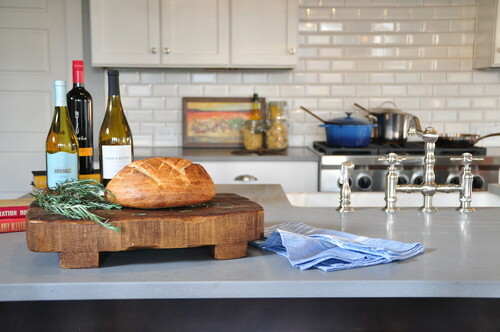 This photo by Ryan Street & Associates captures it perfectly–did we forget to mention the bottles of wine to go with it? Just being able to put your feet up on any ottoman makes a room cozier. If it’s made of a fuzzy material, it heightens the experience. 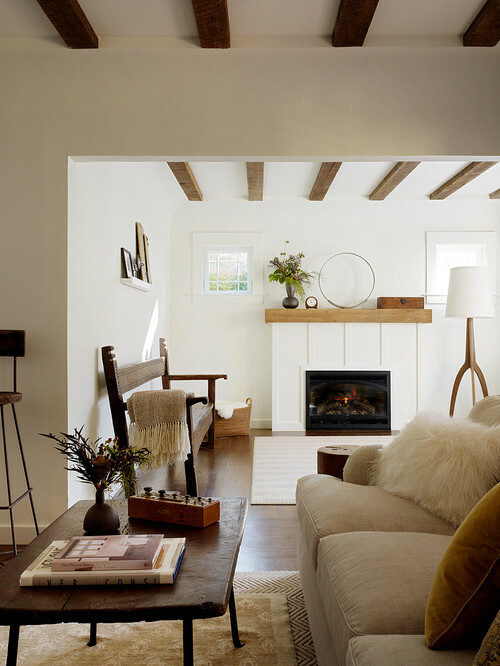 Here Angela Free Design placed one front and center, drawing your eye right to the fireplace beyond. 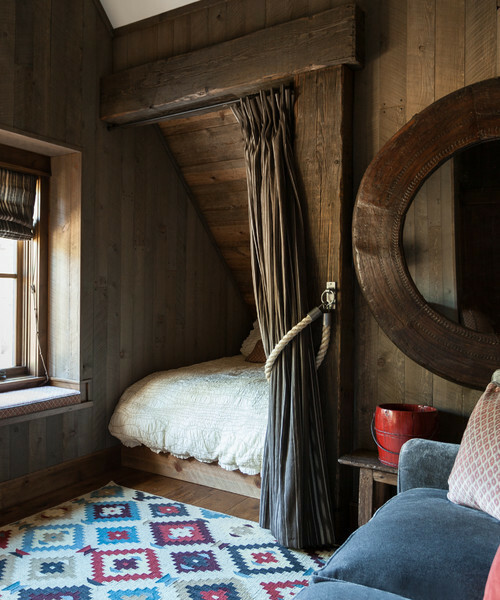 Of course four poster beds with drapery are cozy. 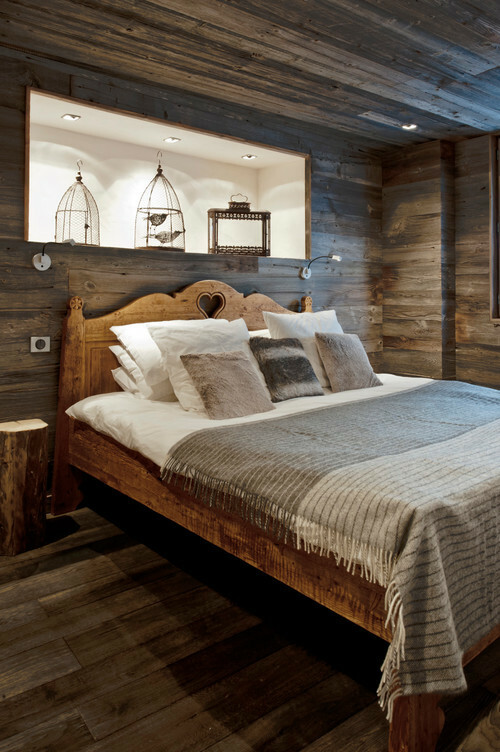 But, this bed from High Camp Home proves you don’t need one to achieve the same effect. They placed it in a niche and hung a curtain so it could be closed off from the rest of the room. It gives the space the coziness of a tent, but with extreme comfort built in. Floor pillows encourage people to sit down by the fire or huddle up to play cards. In this living room Claudia Leccacorvi chose round pillows in different colors, which add a touch of whimsy and sculptural interest as well. There’s something ultra cozy about seeing your dog or cat snuggled into a blanket or on the sofa. This creative design by Cook Architectural Design Studio goes above and beyond the average dog bed! 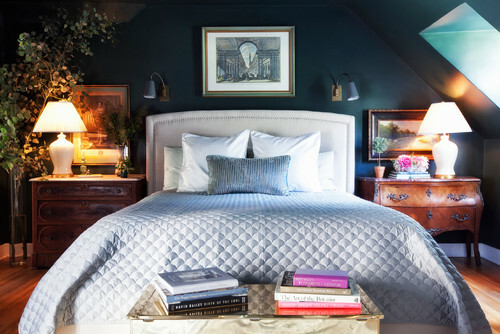 This bedroom by Yellowstone Traditions is so warm and inviting, and that faux fur throw at the foot of the bed adds a glamorous, cozy touch. Nowadays you can buy nice faux fur throws at discount home stores for as little as $30. Soft rugs of any type will warm the room and your bare feet, and can make your house a cozy home the moment you set foot in it. 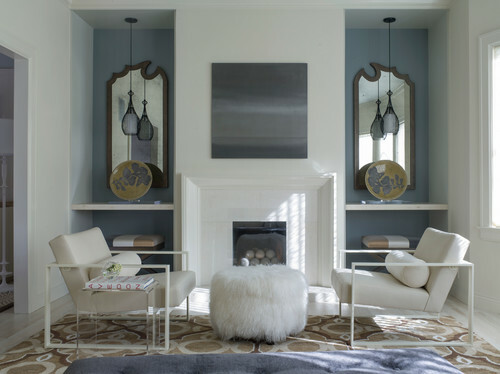 In this living room by Kelly Deck Design, we love how the contemporary white and silvery gray furnishings contrast with the dark floor–and how the rug softens it. 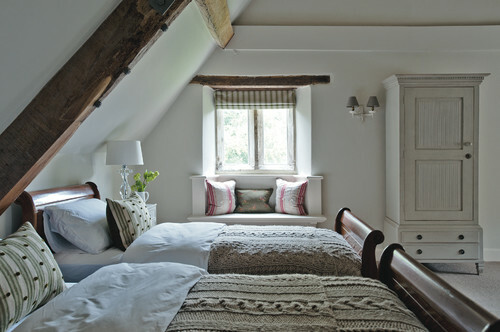 Sims Hilditch placed cable knit blankets on these twin sleigh beds, and they contrast so beautifully with the crisp sheets. They make me think of sweaters that keep me cozy when it’s (brrr…) cold outside. 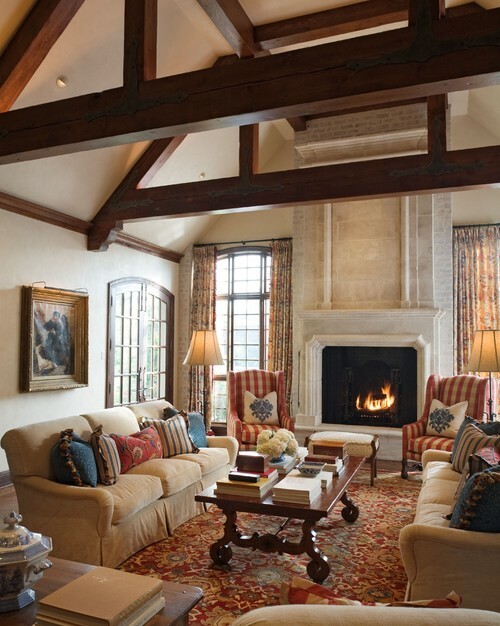 Ceiling beams make me think of mountain houses and old European villas, and this room that Jute Interior Design created goes so perfectly with the beams. What do you do to have a cozy home? I’d love to hear about it.